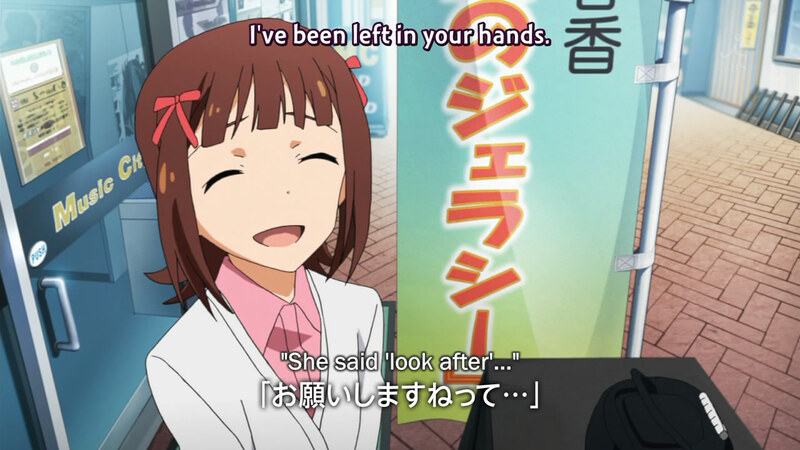 The episode began with what I assumed to be the most main character, Amami Haruka, running into the train station where the unseen cameraman (through whose lens we watched the entire episode) was waiting for her. I say that she's probably the largest character because the OVA painted her as such; I hope it's not true because she's pretty stereotypically bland. 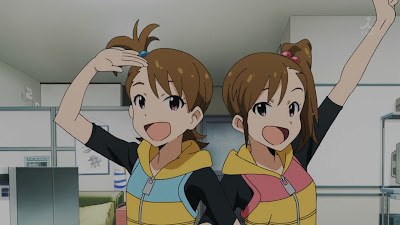 After watching her ride into the city along with various notes on the bottom of the screen (such as the fact that it takes her 2 hours to get to work, so she wakes up very early for her commute), she met up with the boyish idol, Kikuchi Makoto. 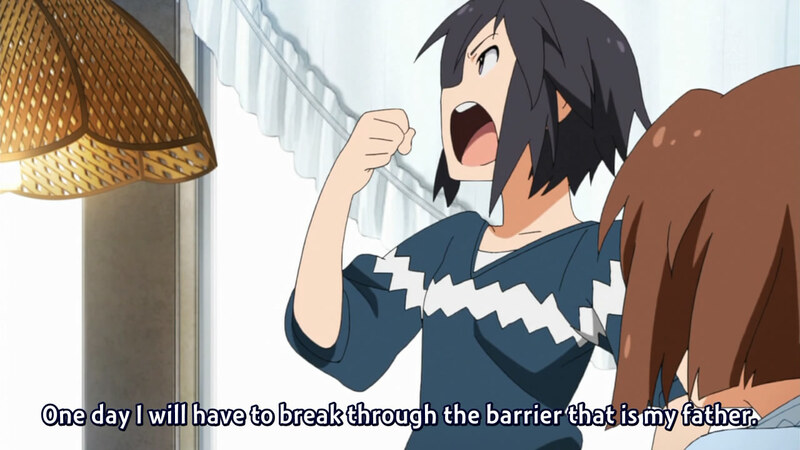 While tomboy-like on the outside, Makoto quickly revealed how she's actually very girly on the inside. I apparently like twins too. Nice. As Haruka and Makoto arrived at the (relatively small) office, the camera began to show the two staff members, Akizuki Ritsuko (who, apparently, is actually also an idol herself) and Otonashi Kotori (the true office lady). 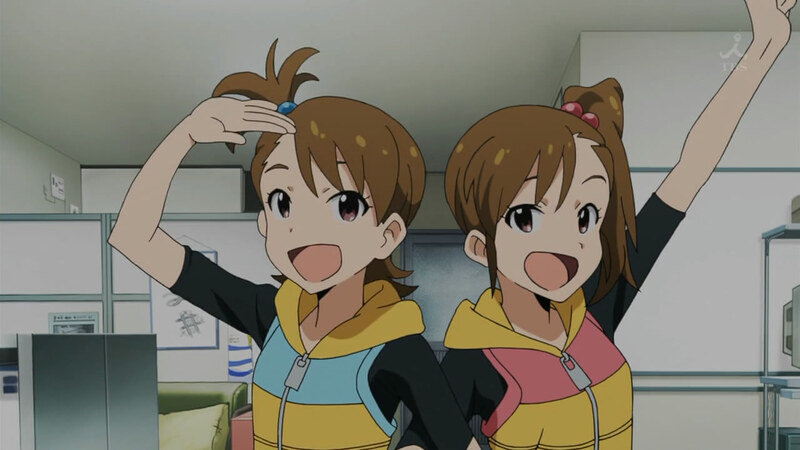 As Ritsuko described various things about the agency, the twins Futami Mami and Ami took over the screen, introducing themselves. Around this point was when I began to forget names; my threshold had been reached. Luckily, Wiki has always been a trustworthy and reliable partner. True fear is going catatonic, not freaking out. 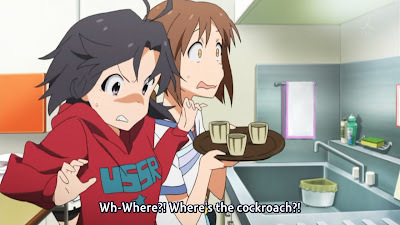 As Ganaha Hibiki lost her pet hamster (Hamzou) and some of the girls began attempting to help her find it, Minase Iori played a trick on Makoto and Hagiwara Yukiho by yelling out that there was a cockroach. 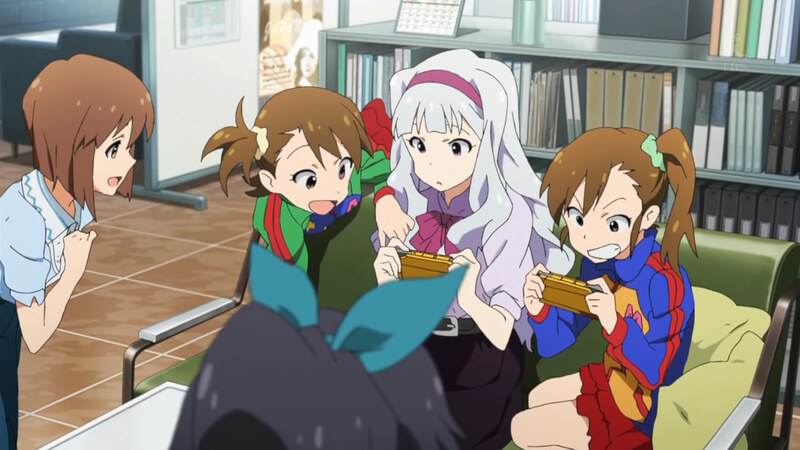 After the furore settled down (with Makoto and Iori at a stand-off), Takatsuki Yayoi reminded the girls of the cameraman's presence and Iori made a proper introduction. The scene quietly shifted to Haruka explaining how an mp3 player worked to Kisaragi Chihaya, who concluded that it was really too difficult for her. Then the scene once again shifted to two of the older idols, Miura Azusa (who graduated from a junior college and decided that if she worked at it for 5 years, she could make it as an idol; it's been 6 months at the point of this episode) and Shijou Takane (a mysterious white-haired girl that seemed the prim-and-proper type). Yes, yes, we know. Tease. The final introduction was the senior year middle-schooler, Hoshii Miki, who was napping on the couch and into whose chest Hamzou crawled into. I won't go into the obvious fanservice provided by providing a middle-schooler with such breasts; instead, I will at least note that it does happen in Japan, and those girls are often willingly pulled out of school by their parents to do picture service to make money. Moving on: as the girls got louder and louder, Ritsuko finally yelled at them to quiet down as Kotori was unable to talk on the phone. After the mid-episode break, the sequence of scenes shifted to follow a schedule. First, Haruka, Miki and Chihaya headed off to a vocal lesson, where Miki spoke about trying hard and showed off some of her vocal chords. 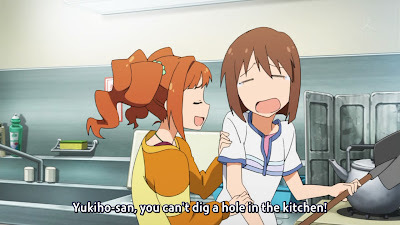 Right after that was a magazine interview that Makoto and Yukiho attended, where Makoto revealed that it was actually her father holding her back from becoming openly girly (since he fought it whenever she tried to do anything resembling a girl) and Yukiho revealed that she was extremely shy and joined after a friend submitted her application. 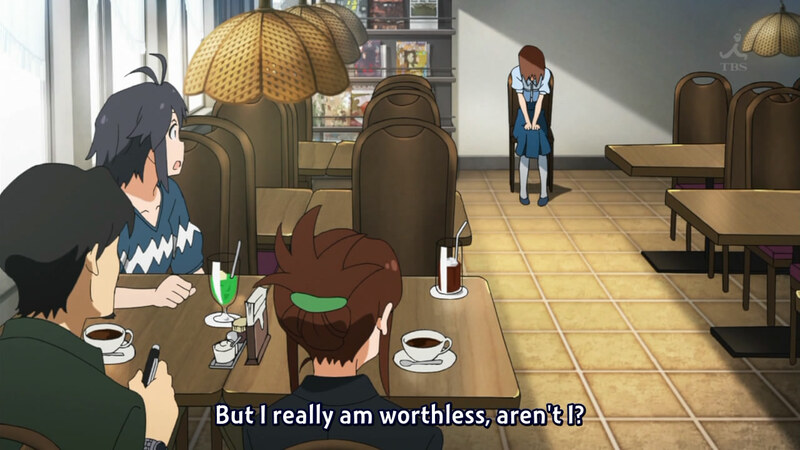 It felt like a dating sim the entire episode...and then I found out it kind of was. I'm not so sure you're allowed to have some of these as pets. 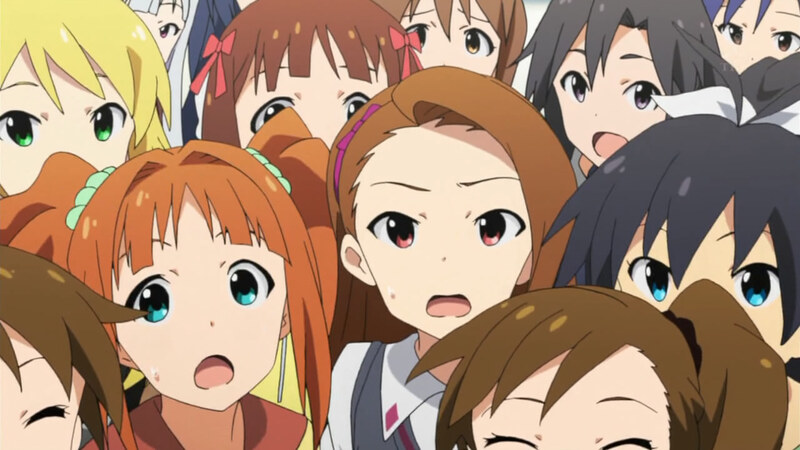 A set of three auditions was shown, with Takane, Hibiki, and Azusa. Takane's audition seemed to go well, with her garnering appreciative chuckles after saying certain questions (such as where she was from) was top secret. (She stated to the cameraman that she just didn't like answering questions about her background when asked out of curiosity.) Hibiki's audition didn't seem to go well after she spent the entire time talking about her pets instead of herself. Azusa, walking back to the agency with the cameraman, revealed that she didn't get chosen for her audition (despite being shown by Ritsuko how to bend down to show the most of her chest), and then her 5-year plan with the agency. Hm, Yukiho, I think I'm going to like you. 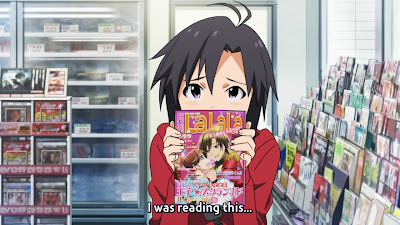 I wonder if this stuff got printed in the magazine. After the ED, the president (Takagi Junichirou) revealed that the new producer that he had hired to manage the girls (Ritsuko being a junior producer, after all) was actually the cameraman, who had decided to figure out what the agency and the idols were all about by doing a "documentary". With the girls both excited to have a new producer and peeved that he didn't tell them earlier, the episode actually ended with Producer (that's his name~) saying he would do his best. While I hadn't expected the unique documentary-style showing of the first episode, the subject matter did seem to turn out to be what I had expected before watching the OVA. 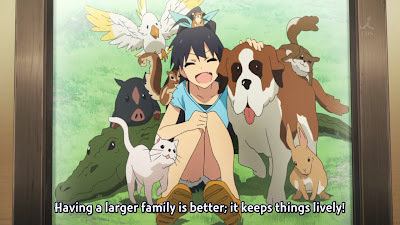 I'm happy that it's not nearly as shoujo and kid-directed as that OVA felt; there actually seems to be quite a lot of interesting things going on here. This seems more focused on depicting a lot of reality, instead of showing pretty girls in surreal situations or forced scenes (although the slew of girls is a nice bonus). 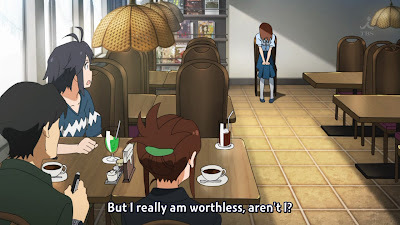 Despite the many, many characters (whose names I can't even remember), I am interested in seeing what of idol life they show, along with furthering the different characterizations.